HMGS® Legion of Honor - Historical Miniatures Gaming Society, Inc. The HMGS® Legion of Honor was established by Board of Directors in 1995 specifically to provide a means by which the recipient of the Society's lifetime achievement award, the Jack Scruby Award, might be chosen every other year. As such it was thought that members of the Legion should also be chosen for their distinguished service to the hobby if they were to act as electors for such an important process.Thus today the Legion acts as a self-electing honor society that not only decides the Scruby recipient, but also serves as a source of inspiration and achievement to which all miniature hobbyists might aspire. Currently the Legion may select up to two new members per year, and may select a Scruby awardee every other year. The Legion has its own bylaws, Commander and Adjutant, while the President of HMGS® serves as the Liaison to the Legion. The Board also provides minimal, on request funding to the Legion, normally supporting the Scruby Award Banquet in odd-numbered years and a supply of miniature medals every decade or so. Currently informal discussions are underway to allow the Legion a more practical and visible part of Chapter life, perhaps as executive agent for some industry based awards. Please contact the Legion through its Adjutant via legion@hmgs.org for more information or to forward a message to one of its members. Members of the Legion receive a certificate, a miniature French Legion of Honor medal and a lifetime membership in HMGS®. Click Here to see the current Legion Members. In the French Revolution all the orders of the kingdom were abolished. It was the wish of Napoleon, the First Consul, to create a reward to commend civilians and soldiers and from this wish was instituted a Légion d'Honneur, a body of men that was not an order of chivalry, for Napoleon, still a revolutionary, loathed orders of knighthood. The Légion did and does however show all the characteristics of an Order of Chivalry. Women were first allowed in the legion in 1852 by President Louis-Napoléon Bonaparte, who later became Napoleon III. The Légion was loosely patterned after a Roman Legion, with légionnaires (soldiers) officers, commandants and a grand council; and the Emperor angrily rebuked anyone who called this institution an order. The highest rank was not a grand cross but a grand aigle, a rank that wore all the insignia common to grand crosses. The members were paid, the highest of them extremely generously - 5000 francs to a Grand Officer, 2000 francs to a Commandant, 1000 francs to an officer and 250 francs to a Legionnaire. According to some sources Napoleon declared: On appelle ça des hochets, je sais, on l'a dit déjà. Et bien, j'ai répondu que c'est avec des hochets que l'on mène les hommes. — "We call these children's toys, I know, it's been said already. Well, I replied that it's with such toys that one leads men." (The French word hochet means a child's rattle). This has been often quoted as "It is with such baubles that men are led." The order was the first modern order of merit. The orders of the monarchy were often limited to Catholics and all knights had to be noblemen. The military decorations were the perk of the officers. The légion, however, was open to men of all ranks and professions. Only merit or bravery counted. 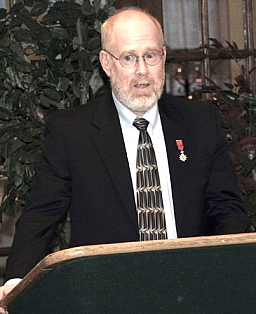 The recipient of the Jack Scruby award also receives membership in the Legion if he or she is not already a member. The latest Scruby winner is Scott Bowden, a native of Arlington TX and the author of several formal history texts, as well as numerous popular wargames, to include the ubiquitous EMPIRE. Please click here for Scott's biography and an informal look at what it takes to rate a Scruby. Once again, please contact the Legion thru its Adjutant via legion@hmgs.org for more information or to forward a message to one of its members. Above Scott Bowden (bottom) receives his Scruby Award while Bill Rutherford (along with Glenn Kidd) are inducted into the Legion during the 2007 Awards Banquet at Historicon. Photos by Mitch Osborne. 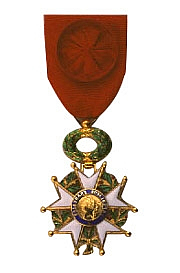 Image of a French Legion of Honor from the Wikipedia article on the same subject, retrieved electronically on 21 August 2007.